For some children, there’s nothing more alarming than the buzz of the clock on the first morning of the new school year. In a few short weeks, your children are in for this rude awakening. We asked Dr. Katie McPeak, Medical Director, Center for the Urban Child at St. Christopher’s Hospital for Children, for back to school wellness advice. 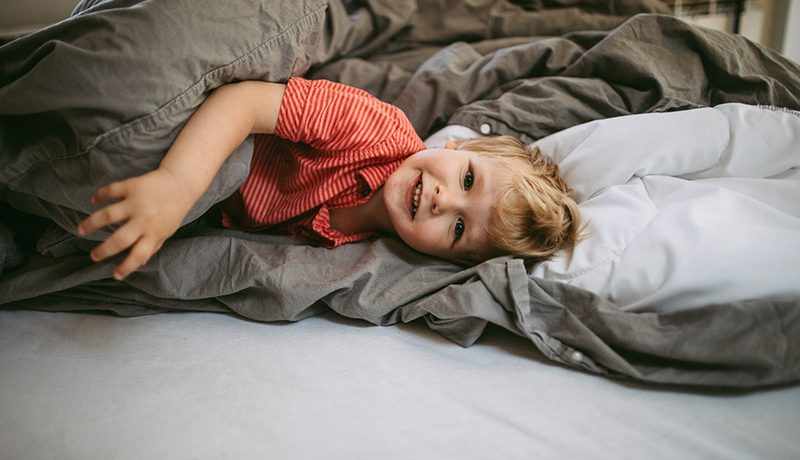 One to two weeks before school starts, try putting your child to bed around 8 pm, allowing them to sleep in to see when they naturally wake up. Dr. McPeak says you can tell by their natural rhythm where they might stand to lose — or gain — a few hours. A rule of thumb is that elementary school kids need approximately 10-12 hours, middle schoolers need 9-10 and high schoolers need 8-10 of hours of rest. Make sure your child is not interacting with electronics pre-bedtime. “Anything that causes brain stimulation has a negative effect on sleep,” says Dr. McPeak. Keep phones, tablets and TVs out of the bedroom and power them down after dinner. Opt for more primal activities, like reading a book together or taking a walk in the evening. Dr. McPeak says your child’s time spent in front of screens should be a reward, not a requirement. “Consider setting a rule,” she says, suggesting a 30-minute timeline Monday through Thursday while allowing “earned” time on weekend nights for accomplishing chores and homework goals. Anxious feelings often come with the territory of starting a new school year. And the best way to ward it off? Talking through it. “I like to recommend family dinner time as a time for discussing the day, stress and the worries,” Dr. McPeak says. Listen to your child actively, without interruption or judgment. “Rather than solving problems for your child, try to help them solve their problems with your guidance,” she says. Of course, exercise is also extremely effective, whether that’s after school play or a family walk around the block. You may also want to consider yoga or meditation as de-stressing practices that can be easily accessible for children. Continuing the pre-AM prep, it’s a good idea to help your child pick out their clothes and pack their bags for the next day. That way, it’s all ready to go when they wake. Most insurance plans cover at least one wellness appointment a year. “It’s not critical to make this visit before school unless your child is due for necessary vaccines or needs an urgent medicine refill,” Dr. McPeak says (she also says that school districts are — rightfully — strict on vaccinations, specifically with children ages 5, 12 and 16). After the start of the school year is also a good time to visit the doctor. “We like seeing kids after school starts so that we can assess how learning and school performance are coming along,” she says.